Breanna Stewart, playing in her first Olympic game, scores 15 points as the U.S. storms to a record-setting 121-56 victory over Senegal. Sue Bird had eight of the U.S.’s team-record 36 assists on Sunday. RIO DE JANEIRO – Diana Taurasi and the U.S. women’s basketball team opened their Olympics with a record rout. The Americans were not expected to be challenged Sunday by Senegal, and the only real suspense was how many records they would set. When it ended, they had set three Olympic marks: Points scored in a game, margin of victory and assists. The players and the U.S. coaching staff were happy with how the team set the records. With a team of WNBA most valuable players and All-Stars, the Americans constantly made the extra pass on offense that led to open shots or layups in the 121-56 victory. Storm player Sue Bird had eight of the team’s U.S.-record 36 assists. The Brazilian fans tried to spur on the African country, cheering loudly every time it scored and booing the U.S. when the Americans had the ball. The fans even shouted down a brief U.S. chant with a Senegal one. The Americans were used to that, having last played in Brazil in 2006 when they lost in the semifinals of the world championship. That is the last time the U.S. lost a game in a major tournament. It showed. 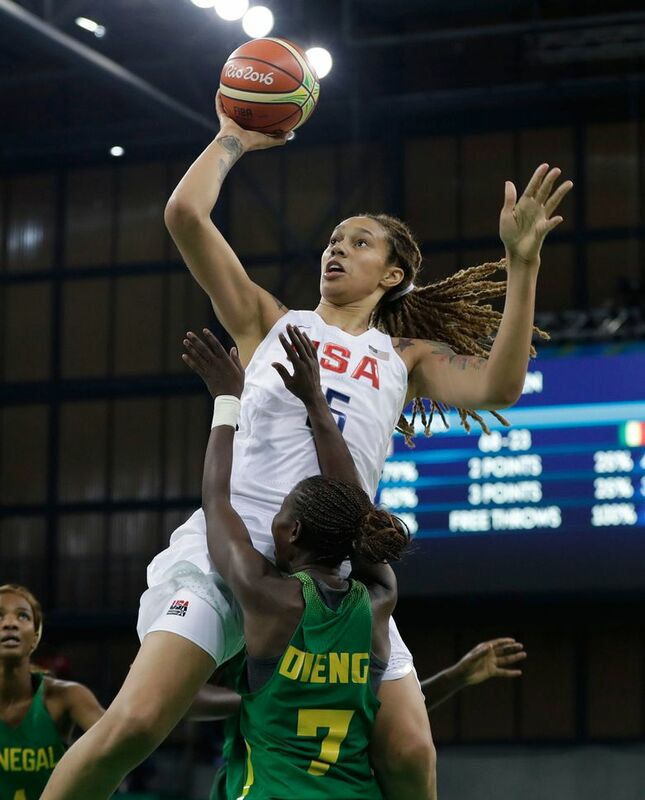 The Americans reached the 100-point mark for the 15th time in Olympic history early in the fourth quarter and Storm rookie Breanna Stewart made a three-pointer with three minutes left to surpass the Olympic-record 114 points the Americans had against China in 2012. They also beat the largest margin of victory in U.S. history, which had been a 60-point decision over Zaire in 1996. The Americans were a 57.5-point favorite coming into the contest. Taurasi swished her early three-pointers as the U.S. raced to a 27-5 lead. The Americans led 35-9 after the first quarter and by 43 at the half en route to a 42nd consecutive Olympic victory. The Americans could face a little tougher test Monday when they take on Spain. • In women’s games that had more drama, Spain beat Serbia 65-59; Australia defeated Turkey 61-56 and France edged Belarus 73-72. • Former Gonzaga standout Domantas Sabonis, an Oklahoma City Thunder rookie, scored 10 points to help Lithuania beat Brazil 82-76 in men’s play. Mantas Kalnietis scored 16 for Lithuania, which led by 30 points in the second quarter and fought off a furious comeback from the host country. Leandro Barbosa scored 21 points for Brazil. • With one big block, Dario Saric gave a glimpse of what the 76ers can’t wait to see in Philadelphia. And he showed why Croatia believes in its chances to reach the quarterfinals in these Olympics. Saric swatted away Pau Gasol’s shot just before the buzzer, preserving Croatia’s 72-70 upset of Spain. Saric didn’t do much on the offensive end, scoring five points on 1-for-7 shooting. Saric was the 12th player taken in the 2014 NBA draft, but kept playing in the Turkish league until signing with Philadelphia last month. • Facundo Campazzo scored 19 points as Argentina beat Nigeria 94-66.